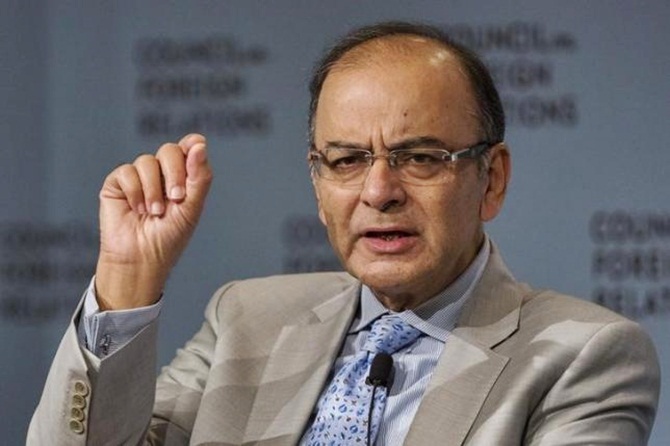 Rediff.com » Business » How has Arun Jaitley fared as Finance Minister? What made Arun Jaitley's inheritance problems more complicated was the fact that he had to face the adverse impact of two successive droughts - in 2014 and 2015, notes A K Bhattacharya. In less than four weeks, Finance Minister Arun Jaitley is to present what will be his third Budget for the Union government. It is reasonable, therefore, to ask questions about his performance as finance minister in the last 20 months. Has he steered the economy competently? Or could he have done better? One way of assessing a finance minister is to evaluate how challenging were the problems he inherited from his predecessor or the predecessor government. And if you look at Mr Jaitley's inheritance, an interesting picture emerges. The problems that he inherited are quite daunting - a broken banking system, a challenging fiscal situation, the adverse impact of retrospective taxation on investments, an imminent burden on government finances on account of the recommendations of the Seventh Central Pay Commission and finally a strained relationship between the central bank and the Union finance ministry undermining prospects of a collaborative approach to tackle the country's economic challenges. Mr Jaitley's inherited problems deserve further elucidation. The rise in the non-performing assets of the banking system did not take place in a day or a week. For months together during the last couple of years of the United Progressive Alliance (UPA) government, the stressed assets of public sector banks, in particular, kept rising even as infrastructure projects remained mired in delays. Many Indian companies saw their indebtedness rise at an alarming pace, while the necessary but tough measures to stem the rot in the banking sector were postponed. With the public sector banks' gross non-performing assets rising to 4.72 per cent of their total loans and their bad loans growing to Rs 2.16 lakh-crore at the end of March 2014, the tasks for Mr Jaitley, the new finance minister, were quite obvious. But the inheritance problem he faced could not have been underestimated. Another factor that clouded India's investment climate before Mr Jaitley took charge as finance minister was the retrospective taxation law that one of his predecessors had introduced. It was a difficult problem. Investors' confidence had to be revived without unduly tinkering with the legislative framework that was already in place. As though this was not enough, the government's public finances posed an even bigger inheritance problem for Mr Jaitley. His immediate predecessor, P Chidambaram, had begun the good work of bringing the fiscal deficit reduction plan back on track, but the target in the interim Budget of the outgoing government was ambitious and difficult to achieve. Mr Jaitley had the political option of discarding the fiscal deficit target of 4.1 per cent of gross domestic product, or GDP, that Mr Chidambaram had set in his interim Budget for 2014-15. But doing that would have triggered a new set of problems - which would only be complicated by another legacy challenge, arising out of the recommendations of the Seventh Central Pay Commission that the UPA government had set up just eight months before its tenure was due to end. As it now turns out, the commission's recommendations would entail an additional expenditure of an estimated Rs 1 lakh-crore or about 0.6 per cent of GDP. In retrospect, it was prudent of Mr Jaitley to have done his best to adhere to the fiscal deficit target of 4.1 per cent of GDP set by his predecessor. In the coming year, he will now have to contend with the impact of the recommendations of the Seventh Central Pay Commission. Another problem that Mr Jaitley inherited was the fractured relations between the finance ministry and the central bank. Even as the finance ministry was openly advocating the need for lower interest rates, the central bank held firm in its resolve to fight inflation by not reducing the repo rate at which it infuses liquidity into the banking system. Steps to repair the relations began to be taken after Mr Jaitley took charge in North Block. A monetary policy framework between the RBI and the government was signed, and today, public airing of differences of opinion between the two on monetary policy issues is a thing of the past. Yet, the challenge is not yet fully over as there is need to resolve many more issues like the setting up of the public debt office, which potentially can be a cause of fresh conflict between the central bank and the finance ministry. What made Mr Jaitley's inheritance problems more complicated was the fact that he had to face the adverse impact of two successive droughts - in 2014 and 2015. As finance minister, he could do little about the successive droughts whose impact the Indian economy had to face. Food prices went up, contributing to the overall inflation level in the first few months after he took charge. The sharp fall in oil prices helped contain the price line, but the droughts did their damage to the rural economy, constraining demand that continues to undermine the economy's growth prospects. Looking back, it would be difficult to find another finance minister who had to contend with such a large number of inherited problems of such magnitude and complexity. The exception is, of course, Manmohan Singh, who as the finance minister in the 1990s had a long list of inheritance problems, which were much more formidable than those that Mr Jaitley had to face. But apart from Dr Singh, the list of inherited problems faced by other finance ministers in the last two and a half decades has been short and negligible. You could argue that Mr Jaitley should have been more aggressive and purposeful in tackling many of these inheritance problems. For instance, there was no reason why the public sector banks' bad loans were allowed to rise to Rs 2.67 lakh crore and the gross non-performing assets to balloon to 5.43 per cent by the end of March 2015. Surely, better ways could have been found to recapitalise the banks. Even the vexing question of retrospective taxation could have been tackled more promptly. Indeed, inheritance problems can no longer be blamed after a finance minister presents three Budgets. That is why the Budget that Mr Jaitley will present on February 29 will be crucial. Can he present a Budget that overcomes the problems he inherited?